2013 is only halfway over, yet the U.S. Centers for Disease Control and Prevention (CDC) just released new figures showing that this year is on track for the most cases of childhood measles in 17 years, mainly due to people not vaccinating their children against this disease. First a little history. By the year 2000, measles was considered eradicated according to the CDC, at least in the USA. In total, from 2001 to 2010 there were just 60 U.S. measles cases a year on average. Then in 2011, measles reached an all-time high in the modern United States with a total of 222 reported cases. However, 2013 is shaping up to be worse as far as measles outbreaks go. The CDC figures show that between January 1, 2013 and August 24, 2013, a total of 159 cases of measles were reported from 16 different states. Kids weren’t the only reported cases, as patients ranged in age from 0 days to 61 years; 18 (11%) were aged <12 months, 40 (25%) were aged 1–4 years, 58 (36%) were aged 5–19 years, and 43 (27%) were aged ?20 years. The good news so far is that no one has died in 2013 from measles, though 11% of folks required hospitalization, including four patients diagnosed with pneumonia. The CDC notes that in almost all cases reported this year, people were unvaccinated. If current trends continue, 2013 is shaping up to have more reported cases of measles than any year since 1996. Plus, keep in mind that the CDC only counts reported cases. Some likely go undetected by health organizations. According to the CDC, high MMR vaccine coverage in the United States (91% among children aged 19–35 months) limits the size of measles outbreaks. However as parents become more leery of vaccines, some refuse to get their children vaccinated and right now some states have coverage levels that are less than 90%. As a parent myself, I’m loath to tell other parents what to do – including whether or not they should vaccinate their children. I did vaccinate my own son against measles and other diseases and here’s why. CDC statistics show that for every 1,000 children who get measles, one to three will die, even with the very best health care. Death aside, around 40% of all kids diagnosed with measles in 2011 had to be hospitalized because measles can lead to scary problems like pneumonia and encephalitis. Measles are just plain miserable for kids. Measles causes high fever, runny nose, cough and a red rash all over the body. Other symptoms often include red, watery eyes (conjunctivitis), feeling extra tired and achy, and tiny white spots inside the mouth (Koplik’s spots). In most cases it takes many days (5+) for measles to run its course. Measles often leads to other, more serious health problems and complications such as, bacterial ear infections, bronchitis, laryngitis or croup, inflammation of the larynx or bronchial tubes, pneumonia, encephalitis (inflammation of the brain that causes vomiting, convulsions and, can lead to coma or death), and low blood platelet count. In my case, I felt like I really didn’t want to watch my son go through all the pain and possible complications of measles thus I got him vaccinated. On top of the above, consider that kids who develop measles need immediate care, yet as Dr. 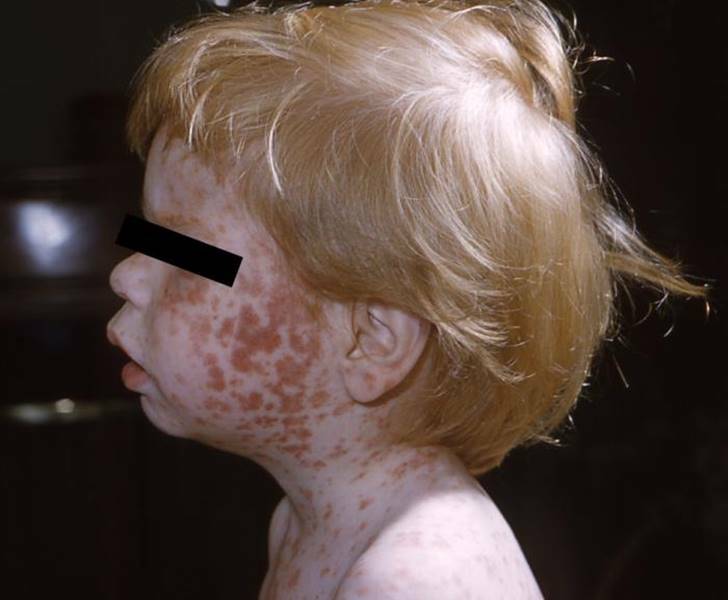 Buddy Creech, a pediatric infectious disease expert at Vanderbilt University told CNN, younger physicians (not to mention parents) might not be able to recognize the signs of measles nowadays as there’s been so few cases since 2000. Additionally if you don’t vaccinate, you have to be ready to accept the future consequences. For example, if you have a daughter, and fail to get her immunized against measles, you may feel fine now about your decision – I mean she may not ever get measles as a child. However, say she grows up, becomes pregnant and catches measles during said pregnancy. Now you’ve created a problem, because pregnant women with measles are prone to miscarriage, giving birth prematurely and low-birth weight babies. Before you make a decision about vaccines, you need to consider all the pros and cons. Check out the links below for more on the subject.